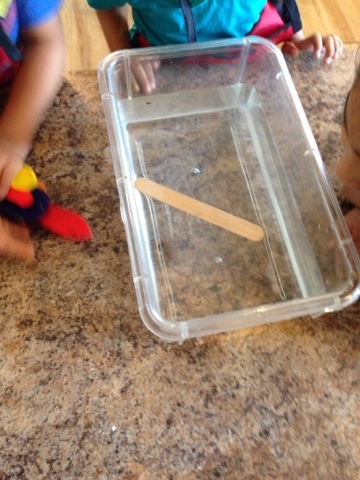 Children were experimenting on which one will float ? They was one small rock in the water .Then one popsicle stick . S said-wow rock is sinking ! 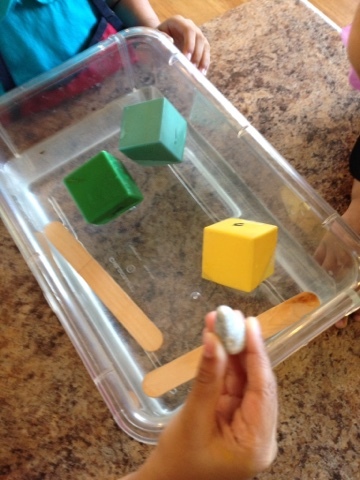 We were outside for outdoor playing --It was a rainy day, children were throwing small pebbles in the water and were curious about how they were sinking .I was asking them on why all the pebbles went down ?S said ,"may be too heavy ".Following their interest I decided to provide this activity inside the class room to experiment and to compare . I was amazed to observe that two girls were really curious and wanted to experiment more about what can float on the water .They were collecting few materials and were trying to see which one was floating and which one was sinking .They wanted to know if the big one were to sink or for the small to sink.Finally they figured out that only the heavy ones were sinking .We made a list in the class and they were very interested to find out more materials which were floating. Mashallah!. Look at the shark ! I got a key shark . 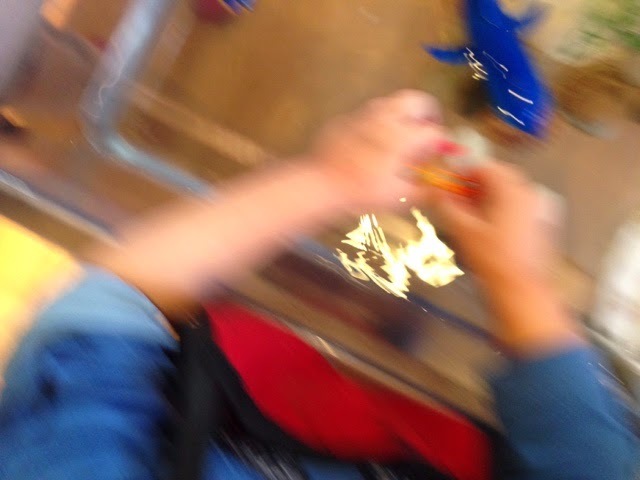 I can squeeze my fish .. Oh no the blue shark will catch my fish . I have the biggest whale and biggest blue shark . 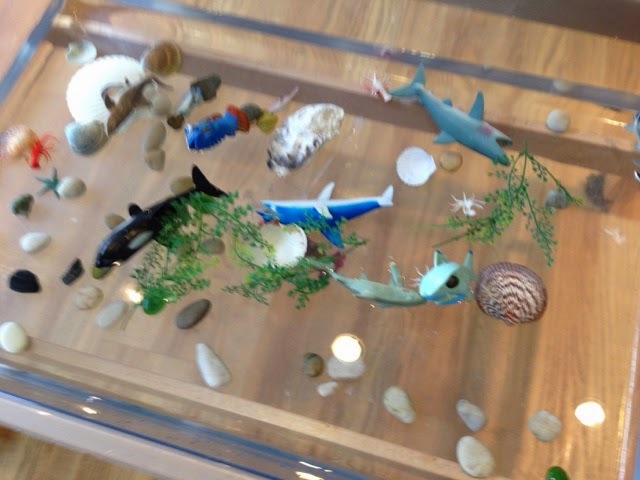 We have been learning about creations of Allah who created the ocean ?What kind of animals live in the water? How will they help us? 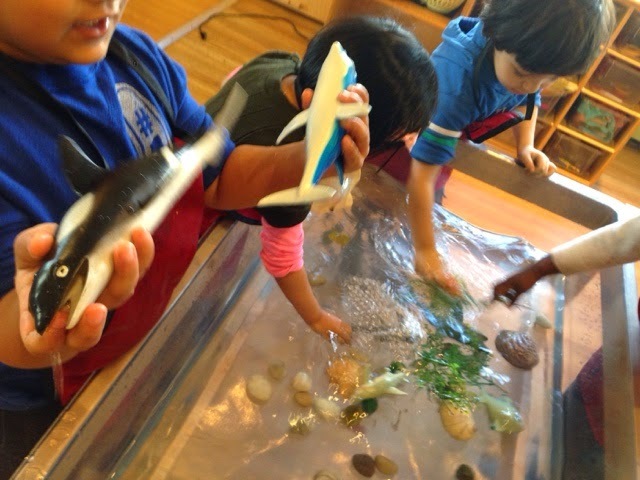 Sensory play with water is fun and engaging for most of the preschool children .They share their ideas with their peers and they communicate and learn to explore more. 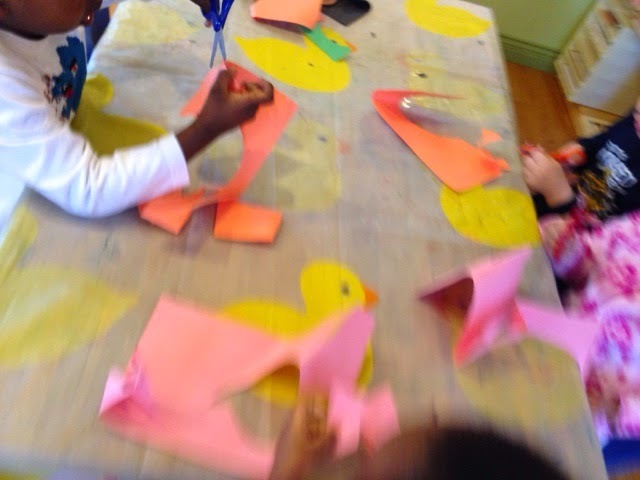 Each child has a different perspective of learning new things. Some of them were playing with other children more. 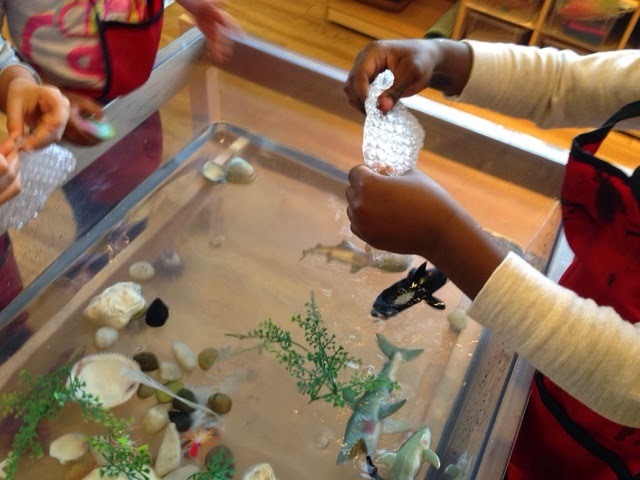 Some wanted to investigate how the plastic fish were floating and why the rocks were not.They were sharing their thoughts to their peers and asking questions. Mashallah! 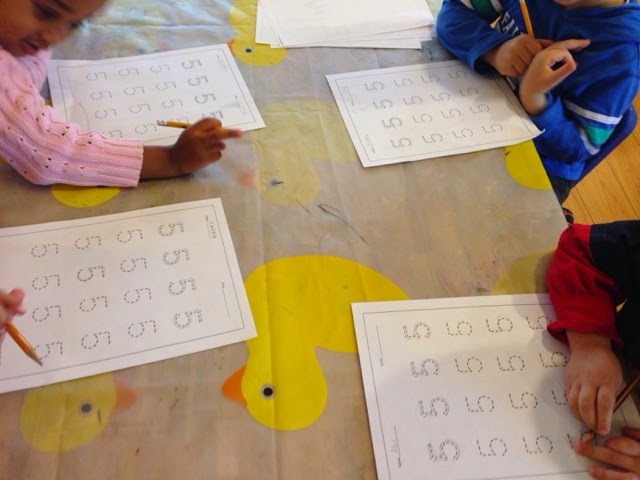 Tracing numbers with a group is fun for the most of children at Preschool.Children love to practice their writing with a pencil ,chalk or other writing material . 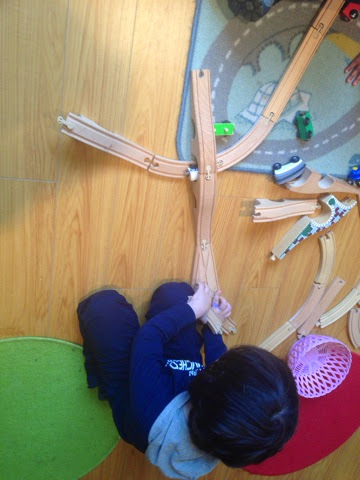 Look my train is going down ! 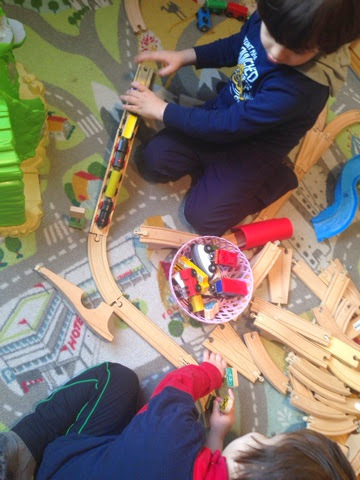 I am making a bridge ..
S and I were working together to set up the train on the track . 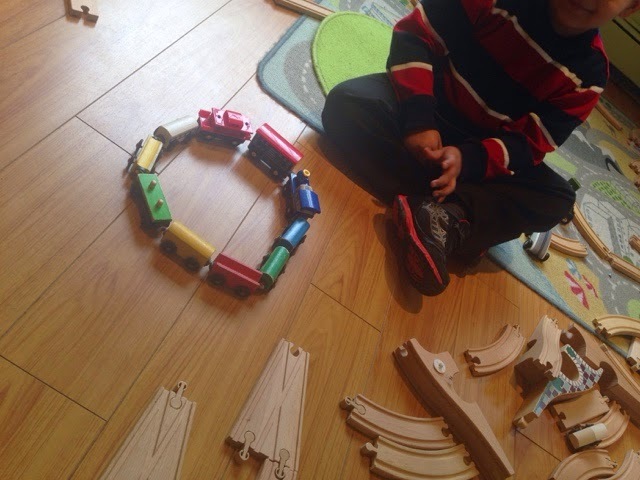 I made a circle with that train and said , I made a rainbow circle . 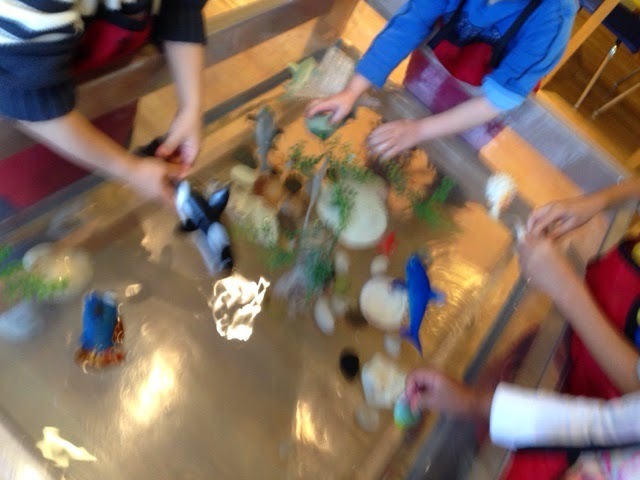 1:Children were enjoying pouring the pine cone from one tray to another bamboo trays and counting home many pine cone were shifting ? 2:Another child was helping how to count accurately to his peer. 3:M was telling F ,I have more pine cones . 4: F said I found a big leaf -that is is yellow too. 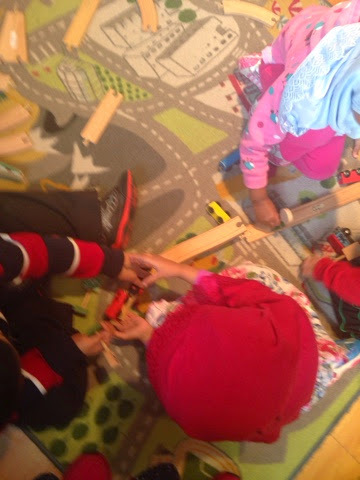 5:They were not only counting or pouring the pine cones,they were also experiencing the texture of the dried maple leaves-how they were making sounds while they were playing with the natural objects . 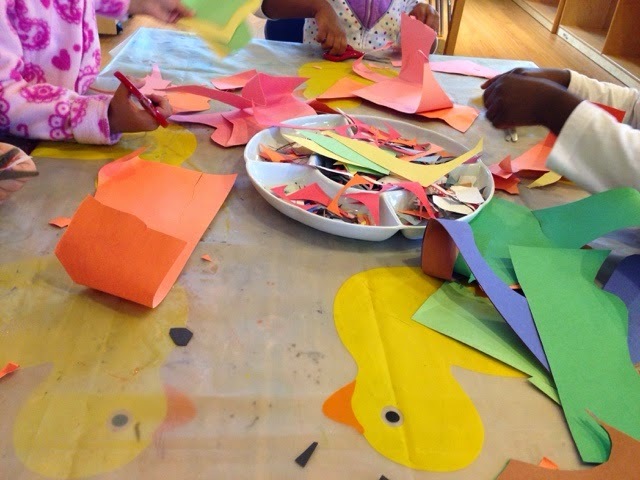 Comment :We collected some multicolored maple leaves and pine cones from our neighborhood to fill our sensory table. The last two months children already observed lots of brown and black Caterpillars,lady bugs, and earthworms when they went outside with the teachers.This November , when they come to the school ,they were observing the leaves on the ground .We decided to pick the maple leaves and pine cones for them .Children were observing the colors, textures of the leave, sand,and pine cones.Also sensing and comparing the differences between them .We provided bamboo tray and basket which gave opportunity to count share and interact with each other . Some children were interested to know the name of the part of the leaves,some of them were counting how many cones they collected .They were enjoying while they were playing with each other . 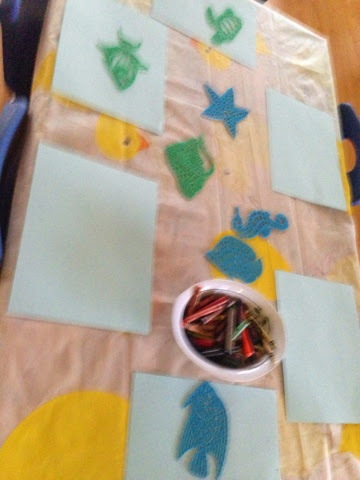 Our class room setup for exploring sea creatures. 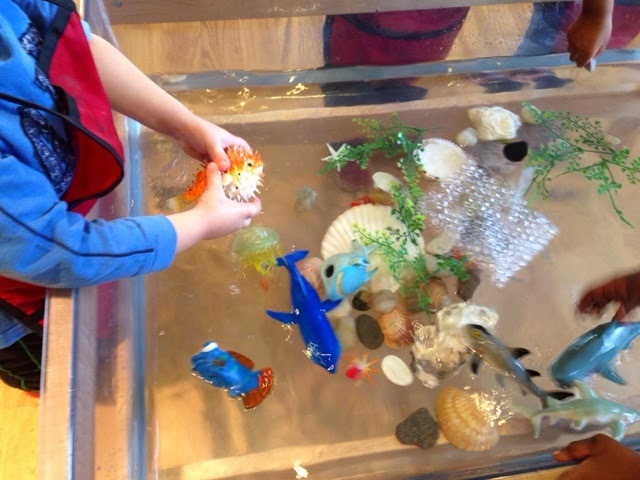 The sensory table is filled with clear water . I provided a few different types of objects to recognize the names . This is to understand why we have it ? To feel the differences and to interact with their peers . 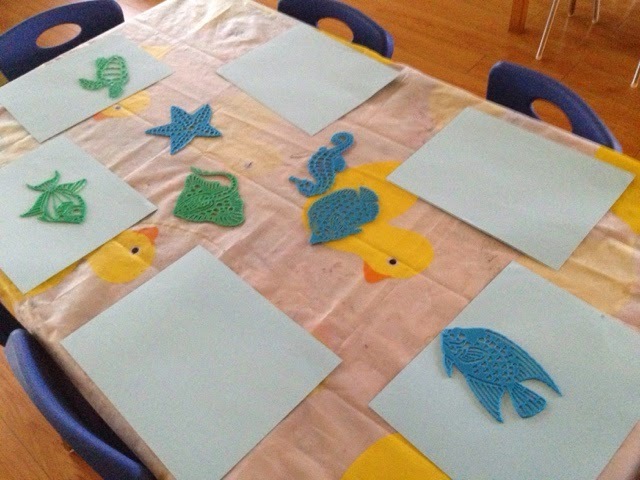 At the art table I have decided to provide blue papers and a few different types of sea creations .Most of the children in my class are between the ages of 3 to 4 years old . 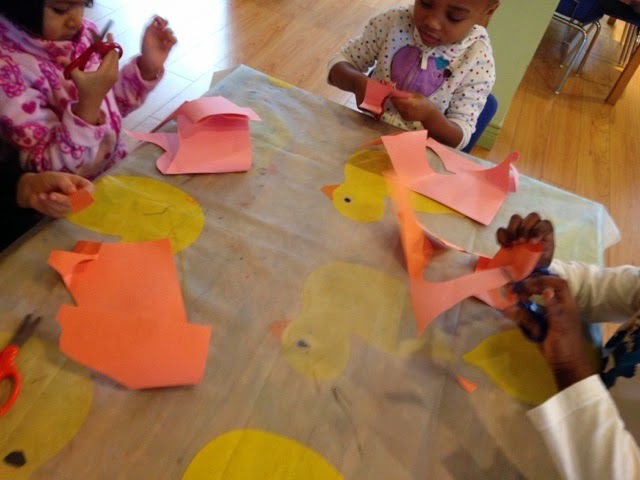 Using color pencils and tracing it on the papers will not only develop their fine motor skills but but also expand their vocabulary skills . 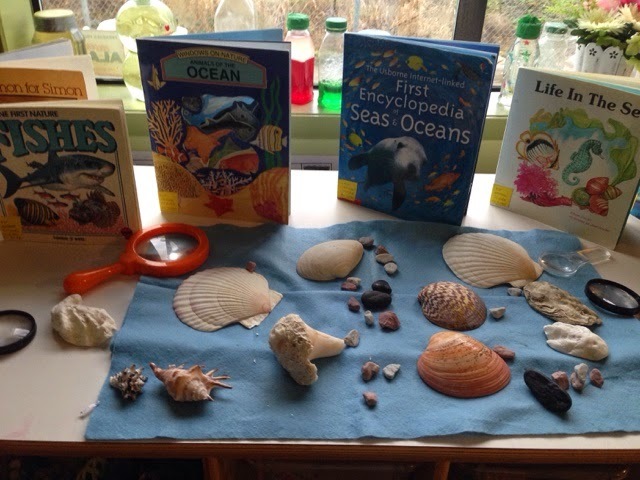 Out science table, my focus was to explore .investigate,compare, and learn about sea creations and their distinct texture . 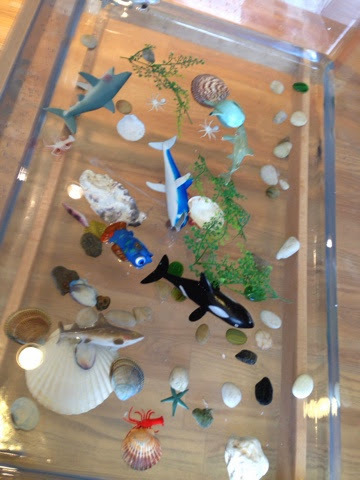 I displayed a few books about sea life, this will encourage children to read and recognize them .